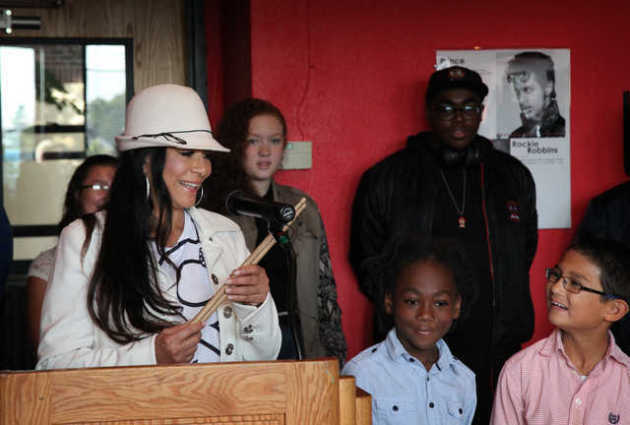 In announcing the latest Prince tribute, Sheila E. pledged that hers would reflect his quiet philanthropy, its proceeds funding programs for Minneapolis' young people. Prince's former drummer and fiancée told reporters Friday morning that when they were on tour together for "Purple Rain," Prince would make time to play music for children, turning a hospital cafeteria into a concert hall. "Prince loved helping people without saying anything, without ever telling anyone or call[ing] the press," Sheila E. said. "He just did it quietly." She outlined the details of the Oct. 23 concert at Orchestra Hall at a press conference in the Sabathani Community Center, surrounded by young musicians in a room lined with records. Tickets -- which range in price from $43.50 to $153.40 -- go on sale Monday. Proceeds will boost the Purple Philanthropy Fund, which will be administered by the Twin Cities Mobile Jazz Project. That fund will benefit arts nonprofits and foundations that were important to Prince, Sheila E. said. "Now that he's gone, there is no money flowing into his foundations now," she said. "We're here to help." After Prince died April 21 of an accidental painkiller overdose, Sheila E. said she would spearhead a Prince concert at the new U.S. Bank Stadium. But once things evolved with Prince's estate and its administrator, others took charge of that concert's planning. "Everything kind of dissipated," she said Friday. The family changed the date of that concert, she said, which will now be held Oct. 13 at the Xcel Energy Center in St. Paul. By the time it was booked, Sheila E. had a show planned for that night in suburban New York City. "We were already booked eight months ago," she said, and "couldn't get out of it." "I try to keep my word." Sheila E.'s father, percussionist Pete Escovedo, will play the Oct. 23 show, as well as young local musicians. There might be "couple other special guests," she added. "It's just one big family." She's been playing plenty of Prince tunes on her tour, she said. "Him and I have written so much music together, and we've played together on a lot of stuff. I just feel it's a part of me." Every few sound checks, she picks a new tune or two, she said: "Man, I remember this song, let's play this song." Audiences appreciate it, Sheila E. said, and it's fun. "It gets emotional," she added. "It's hard sometimes." She paused, blinking quickly as her eyes filled with tears. "All of it is hard."